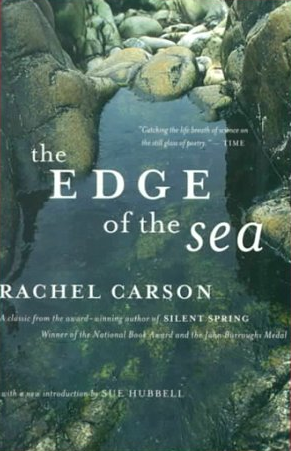 The Edge of the Sea was a book Carson had always wanted to write. Her idea for it began while she still worked at the US Fish and Wildlife Service. She thought of it as a "field guide," and Houghton Mifflin editor-in-chief Paul Brooks had a similar idea in mind when the two first met after Carson achieved literary fame with The Sea Around Us. But as Carson visited each coastal area and began writing, the book became much more than any typical "guide book." It has all the hallmarks we now associate with Rachel Carson’s prose. Once again a scientifically accurate exploration of the ecology of Atlantic seashore, but also a hauntingly beautiful account of what one can find at the edge of the sea. She explores a tide pool, and an inaccessible cave, and watches a lone crab on the shore at midnight. Each is a memorable encounter. Aided by a Guggenheim Fellowship, Carson produced this exploration of the rocky coast of New England, the sandy shores of the Mid-Atlantic, and the coral shores of the lower South. Each area is described with its teeming animal and plant life all of which Carson describes with imagination and wonder. Few books have conveyed the process of evolution so dramatically or given us such an intimate glimpse into the awe and mystery of the natural world. This was also her first collaboration with her friend Bob Hines, an artist, whose drawings accompany Carson's rich descriptions. (see, John Juriga,Bob Hines: National Wildlife Artist. ) Best of all, The Edge of the Sea completed Carson’s trilogy on the sea and established her as the premier "biographer" of the sea.